The 29.10 metre Blue Angel 2 has been launched by Sanlorenzo at a ceremony attended by her Italian owner, his family and the employees who built the yacht. The yacht was designed by Francesco Paszkowski. Blue Angel 2 is the fifteenth yacht in the SL96 series. 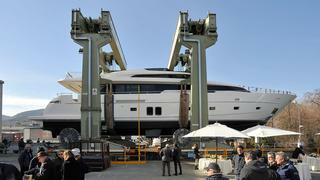 She is also the first of six launches scheduled in just two months at the Italian shipyard. In the coming weeks, Sanlorenzo is going to launch two more SL96 models, three SL106 models and one of the new SL86 models. The SL86 only made its debut last year and 11 units have already been sold. Blue Angel 2 is the fourth Sanlorenzo yacht to be built for the same passionate owner. She has a traditional layout with a forward owner’s cabin on the main deck and four guest cabins on the lower deck. The interior features elements from several different Italian designers, including a kitchen by Boffi, leather upholstery by Foglizzo, leather sofas by Minotti and outdoor furniture by Roda and Paola Lenti. One of the most notable additions to Blue Angel 2 is the innovative ‘high-low system’ developed by the Sanlorenzo Technical Department. The sliding system can be adjusted in order to control the amount of light let in through the windows on the main deck, without impacting on the external lines of the vessel. Twin diesel MTU 12V 2000 M94 diesel engines give the yacht a top speed of 25 knots. A draught of just 1.93 metres is ideal for shallow water anchorages.